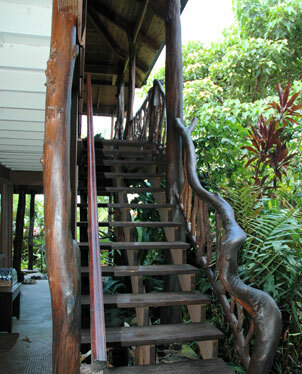 Unique homes on the Big Island draw visitors interested in architecture and local lifestyles. Sitting in front of King Kamehameha's Kona Beach Hotel one morning, Patricia Peterson saw about 50 Asian businessmen board a bus to go golfing while their wives waved goodbye. She wondered, "What are the women supposed to do while their husbands are out on the course, wander in ABC stores all day?" » Cost: $95 per person, including transportation, a gift bag, brunch and guided tours of the homes. Kamaaina receive a 10 percent discount. There's a minimum of six and a maximum of 12 people per tour. » Notes: Guests should be able to walk on uneven terrain. The tour isn't recommended for people who aren't mobile or for children younger than 10. Ask about private tours with a personalized menu. The courses change seasonally and according to each group's preferences. Special dietary requests can be accommodated if they are made at least two days in advance. » First course: Pineapple, guava and tangelo juice; breakfast breads including taro, kabocha squash with cardamom and ginger, banana/macadamia nut, and cappuccino bread with local chocolate; Kona coffee with whipped cream and Kahlua or Baileys Irish Cream. » Second course: Mango gazpacho, taro and sweet potato chips, guacamole and tropical fruit salsa. » Third course: Chicken macadamia nut salad in papaya, lomi salmon in avocado, lilikoi cilantro shrimp on pineapple basmati rice. » Dessert: Handmade ice cream and sorbet, sweet potato haupia terrine, mocha brownies, lilikoi mousse. A week later, Peterson read a newspaper story about an American kitchen and bath expo in Tokyo that was initially scheduled for two weeks, but had been drawing crowds for a year. That, coupled with research from the Hawaii Visitors Bureau & Convention Bureau that indicated most visitors were looking for genuine lifestyle experiences in the islands, convinced her that a home tour business was a viable idea. Peterson had become acquainted with the concept of home tours while traveling in China, Italy and Finland. Remembering how much fun she'd had seeing how people live in exotic places, she partnered with a friend, chef Ann Sutherland, to start Home Tours Hawaii last November. Following the progressive dinner format, the four-hour tour gives participants a memorable taste of the Big Island on visits to an oceanfront townhouse, an Upcountry cottage and a luxurious estate. Interesting facts about the property, a fresh fruit demonstration and a delicious brunch course featuring local products, many grown on the properties, are shared at each leisurely stop. The tour also includes a surprise, which could be a keiki (children's) hula performance; an excursion to a farmer's market; or a presentation by a local expert, be it a Kona coffee farmer, a canoe paddler or a botanist familiar with native Hawaiian plant species. "We take you away from the big resorts, shops and luaus to catch a glimpse of life in different Kona neighborhoods," said Sutherland. "The first house has a beautiful location right on the water. The second is unique in that parts of it are recycled; for example, the porch was rescued after being washed down a river in Oregon, and the doors and windows were salvaged from various construction projects. It's also off the grid and made mostly of tropical woods such as koa, ohia and monkeypod. "The third house is on an acre of land. It's grand and gorgeous, with five bedrooms and four baths, and the kitchen has been remodeled with all the bells and whistles." Peterson and Sutherland guide each tour, pointing out furniture, art, architectural features, and plants and trees growing in the yards. "To us, a true home tour means you see everything -- the kitchen, bathrooms, bedrooms and living areas," said Sutherland, adding that "guests really seem to enjoy my food demonstrations. I show them how to make outrigger canoes out of pineapples; how to wrap laulau in ti leaves; and how to cut lilikoi (passion fruit), mountain apple, guava, pomelo and other fruit." 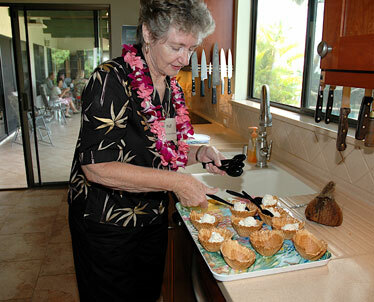 A Home Tours Hawaii tour also is highlighted by a home-cooked casual, gourmet lunch utilizing local produce. SUTHERLAND HAILS from the North Shore of Oahu, where she grew up on fresh fruit, taro, opihi (limpets), mahimahi and other bounty from the sea, all staples for the early Hawaiians. When she was 16, her mother, acclaimed paddler Audrey Sutherland, sent her to France to study art, language and cooking. Classes at the Culinary Institute in New York and subsequent world travels -- from Greece, Guam and New Guinea to Sweden, Senegal and Sri Lanka -- broadened her cooking perspectives. Sutherland's career includes eight months as Ethel Kennedy's personal chef, during which she prepared meals for Art Buchwald, Andy Williams, Cloris Leachman and other celebrities. Other jobs took her to the Virgin Islands and the Midwest before she settled on the Big Island in 1988 to open the Hyatt Regency Waikoloa (now the Hilton Waikoloa Village). Before focusing on Home Tours Hawaii, Sutherland also was the executive chef at Mauna Lani Resort and the Regency at Hualalai, and owned and operated Mean Cuisine in Waimea, which offered ready-made gourmet dishes that customers could heat at home. Home Tours Hawaii combines two of her passions, cooking and stagecraft. "Also, working together with Pat is a delight," she said. "We never get tired talking to our guests about the Big Island's amazing produce, flora, architecture and interior design. They also appreciate the opportunity to experience those things up close. It's a very different perspective than seeing the island from the window of a big tour bus." Sutherland also likes the small groups, which allow her and Peterson to get to know the guests. "We've discussed everything from sovereignty to where they can find the best sushi in Kona," she said. "It's as though Pat and I have a party with new friends six days a week!"